Between the age of 0 – 5 years, children are said to be most absorbent and these are the formative years of the child so it’s the best to start this time! At iSpark, through the Sparkling Minions programme, a Holistic Module designed especially for toddlers (1.5 years – 3 years), we aim to provide the right environment and impart the right values to the stars of the future!Creativity, Independence, Confidence, Exploration, Movement, Happiness, Experienced & Fun Loving Teachers, Clean & Colourful Environment and Child Friendly Ambience. 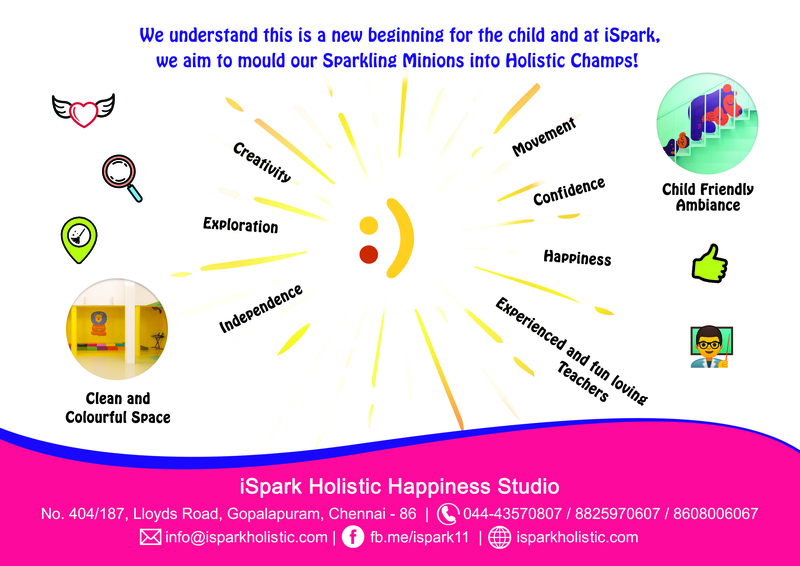 (We can have these as bullet points)We understand that this is a new beginning for the child and at iSpark, we aim to mould our Sparkling Minions into Holistic Champs!